Remember when your mom used to pick out your clothes for you, so you didn’t have to worry about putting together an outfit? I sometimes miss those days, because I struggle to find something to wear every morning. Hiring a personal stylist is not in most people’s budgets, unless they’re celebrities. 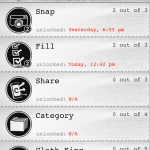 So, this week I checked out two free apps that can help you manage your wardrobe: Netrobe and Cloth. I found Netrobe to be the more useful app of the two. With it, you can photograph each item in your closet, which takes commitment, but gives you the ability to digitally create outfits. Meanwhile, Cloth lets you record your daily looks, and has more of a social twist. It’s easy to use, and has a nice interface, but it will appeal more to fashionistas than to those looking to organize their closets. Neither of these apps are designed specifically for women. In fact, Cloth says it has a strong base of male users. That said, I asked a group of guy friends if they would ever use an app to plan their outfits; none of them were into it. Netrobe is currently only available for iOS devices; support for other platforms is in the works. What attracted me most to the app was the ability to catalog all my clothing, shoes and accessories. Since I have all these items stored in different places in my house (closet, dresser, chest), I sometimes forget what I have, and end up wearing my current favorites pieces over and over. But Netrobe helped me get organized (and clean out my closet), and provided me with an easy way to assemble and test out new looks. It was great for planning outfits for a wide range of occasions, everything from what to wear to work to an upcoming wedding in May. 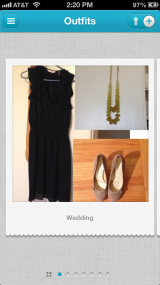 There’s also a Friend’s Activity feed, where you can see what other people are wearing and draw inspiration from them. 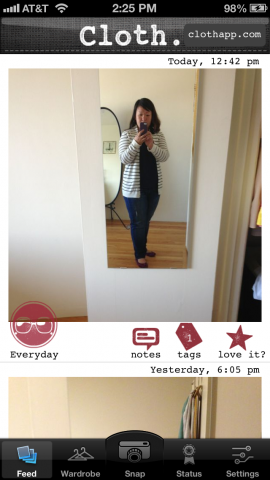 From the My Netrobe section, you can create a new category, such as tops or jeans, and then start taking pictures of your clothes. 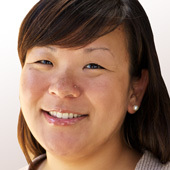 To each photo, you can add details like brand, color, size and season. All this information is searchable from within the app, which I found particularly handy when trying to look for a certain color top to match with bottoms, for example. There are also photo-editing tools, such as a cropping option to help you remove unwanted background images, and Instagram-like filters if you want to spruce up your photos when sharing outfit ideas with others. While I was initially pumped about creating my virtual closet, I grew bored after photographing just a dozen pieces of clothing and inputting all the information. It’s a tedious task, but I found that tackling one to two categories a day made it more manageable. And it was worth it in the end. You can create a look by going to the app’s Styleboard section and dragging items from your collection to a blank board. 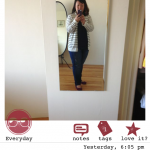 The visual made it easy to see what worked and what didn’t, and I could easily plan my outfit for the next day on my smartphone while watching TV. 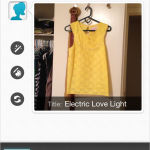 You can share your looks with friends via Facebook, Twitter and Tumblr. As I mentioned before, you can see what other Netrobe users are wearing from the Activity feed. You can “Like” items, add comments or reshare. As with Pinterest, you can also repost ideas (you have to save the images to your photo gallery first) from fashion blogs or websites to use as inspiration later. My only complaint about Netrobe is that the user interface isn’t always very intuitive. For example, it’s not immediately clear that you can add more details other than a title to a photo. I only found the other fields after accidentally tapping elsewhere on the screen. The app can also be slow to load at times. 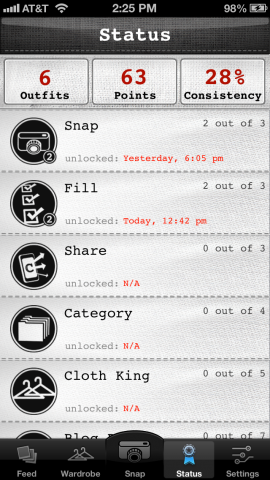 The other app I tried is called Cloth, which is free, and only available for the iPhone for now. 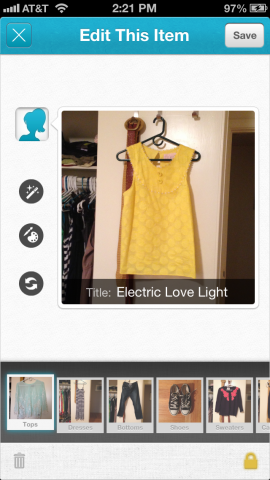 A 99-cent paid version of the app provides outfit recommendations based on the weather in your area, and adds photo filters. 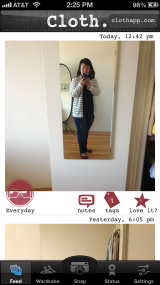 I tested the free app, which handles wardrobe management differently than Netrobe: Instead of logging every piece of clothing in your closet, the app was designed more for taking a photo of your outfit for the day or for a certain event. Cloth’s user interface is much more straightforward than Netrobe’s. 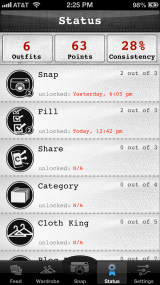 From the main screen, you can access all of the app’s different sections, such as Feed, Wardrobe, Snap and Status. With Netrobe, you have to navigate to a second screen to access the different menus. To add a photo, you can tap on the Snap icon, which will give you a choice of either activating the camera or choosing an existing picture from your photo library. Then you can add tags and notes about where you wore the outfit, select a category (everyday, evening, vacation, and so forth), and more. 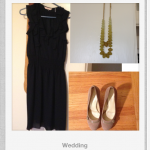 The photo is then saved into your feed, and you can view any outfit by category under the Wardrobe section. It’s certainly a nice way to keep tabs on the looks you’ve worn, and you can take photos of individual pieces. But there’s no way to categorize it by type or to assemble looks, so I didn’t find it particularly useful for planning outfits or cataloging the contents of my closet. Social networking plays a big part in Cloth. Similar to the location-based service Foursquare, you can use this app to unlock achievements and earn badges for certain tasks, and many have to do with sharing photos on social networks like Facebook, Twitter and even Cloth’s blog. I’m not really one for taking self-portraits in the first place, so I already felt weird about taking pictures of myself in outfits. I really didn’t want to share them on my social networks, but, for the purpose of testing, I did it. It’s certainly not required, and earning badges is more of a game than anything. In the end, I found Netrobe to be most useful for my needs, which was organizing my closet and planning outfits. But if you love fashion and sharing ideas with friends, Cloth is an easy way to do it.